The 76th EAGE Conference & Exhibition 2014 was officially opened at 6p.m., June 16th, 2014 in Amsterdam. Our technical manager, Liu Bin, attended this exhibition. 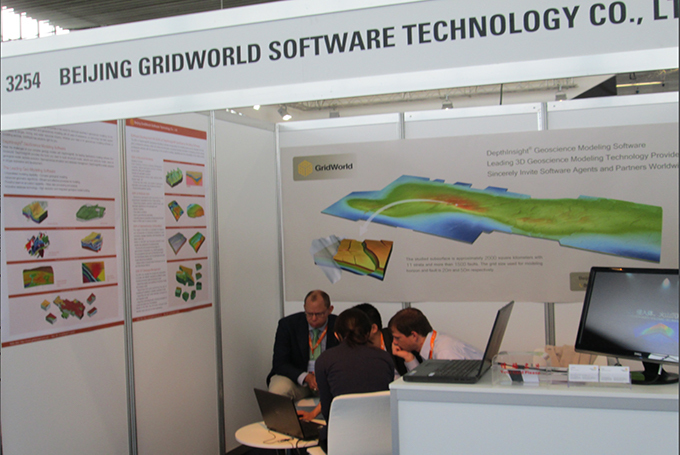 In this exhibition, the modeling capability of our geological modeling software, DepthInsight®, has been recognized by experts all over the world and presents our great advantages of complex structural modeling technology. We mainly proposed the cooperation model of SDK, which aroused the attention from international companies. Some well-known oil companies visited our booth and had technical exchanges, such as DGB Earth Sciences, Schlumberger, CGG, Hulliborton, etc.. After having a further understanding about our products, they expected to collaborate with us in the pattern of SDK so that the modeling capacity of their platforms can be enhanced.